Finger-knitting has done grown up, as I like to say. 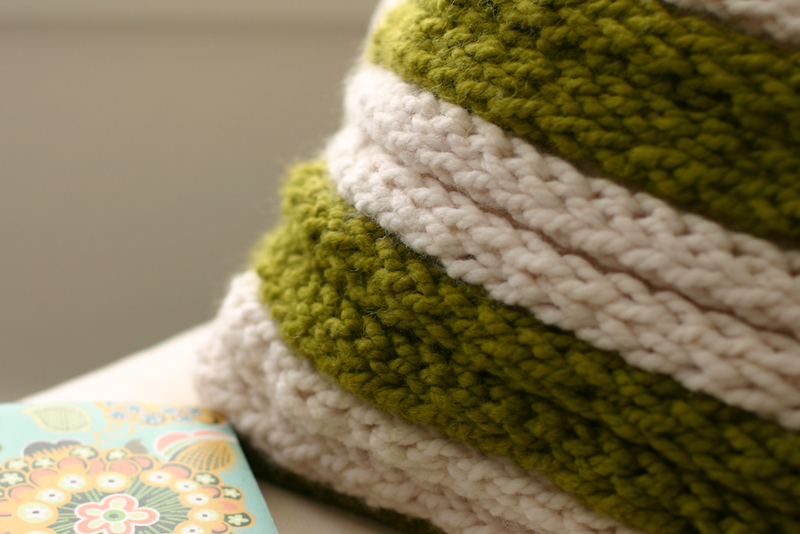 My latest finger-knitting project DIY is featured on Design*Sponge today. I have always thought finger-knitting quite beautiful. How sad that it is typically relegated to the world of “children’s” craft. Not that it isn’t a great craft for young children (to learn how, click here), but this pillow is here to step out and say, consider me. I think it is modern and updated and a perfect way to achieve that chunky knit look without actually knitting! Allie and I had so much fun making this pillow together. She made the string of green, I made the white. We are currently in discussion over where the pillow is going to live. I love it on my studio chair, don’t you? The pillow is made of two skeins of Lion Brand Wool-Ease Thick and Quick and check out Design*Sponge for an easy tutorial to make it. Isn’t the texture wonderful? If you’re curious and would like to see more fabulous finger-knitting projects, check out this gallery of 5 Fabulous Finger-Knitting Projects by clicking the button below. I am actually off to Miami today for a long weekend with my girlfriends. I am all giggly with excitement. At least I’ve left something cozy behind me. That pillow is fantastic. My daughters love finger knitting (and we have a crazy amount of scarves, jump ropes,etc. to prove it!). I’ll be showing tutorial. Excellent! Finger Knitting is my kind of knitting! My kids love it too! Love your pillow & tutorial, Anne. Thanks! Love your site!!! I wanted to share with you that I made your DYI colored sand and it came out so well!! I had done this before with regular sand and chalk and it was so dull, so I was impressed with the brilliant colors. Yay! It is all on my blog for kids activities and I left linky love. Gianne, Thanks so much! I’m glad you’ve been giving the projects a try. Makes me so happy to hear that! Going to go check it out now! I think I feel my next project coming on!!! 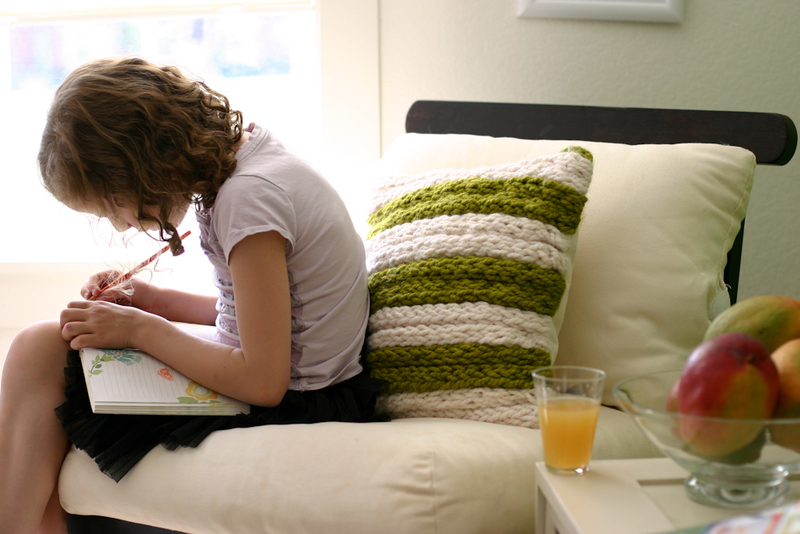 LOVE this pillow and I have many little hands around to do the knitting for me! Your tutorials are fabulous! Thanks! I’ve posted a bunch of crazy ideas for finger knitting projects that we’ve been coming up with around our house, and you’re the inspiration behind at least one of them! 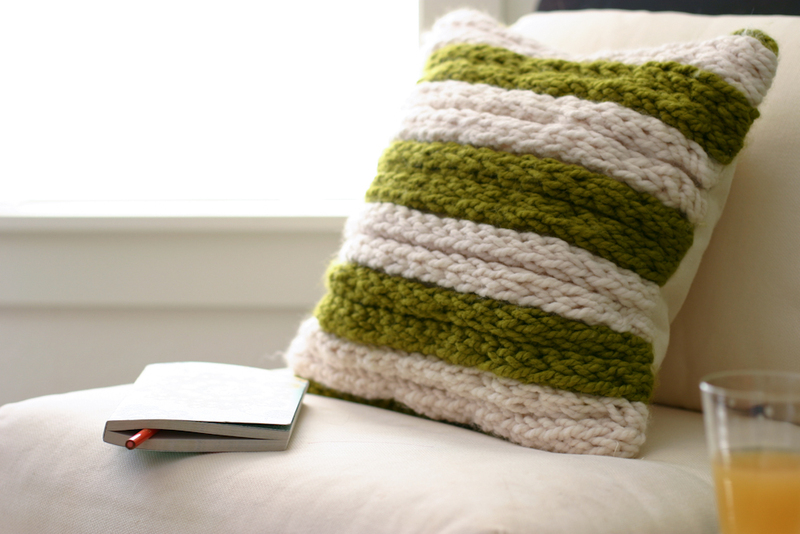 That is a gorgeous knitted throw pillow! I want one for our home too, if only I knew how to crochet. The pillow is sooo cool!! Do you just sew the finger-knitted strips together to make the front of the pillow?? Hi. I just found this and would like to try it. Wondering if the finger knitted strands could be “sewn” together to make a wider scarf, instwasa of a pillow. Have you tried that or seen other projects similar. Thanks. Fabulous knitting project. A pillow or pallet dressed in knitting is pretty neat.